Looking for a Portable Scissor Lift? Top 7 Models for Your Home Garage. Some people are surprised to learn that they can fit a portable scissor lift in almost any home garage. In fact, the vast majority of car lifts are meant for low ceilings. With the exception of full-size two-post lifts, which are found in virtually every commercial auto shop, many lifts will fit in home garages and do not need to be bolted down. That's a huge advantage, especially for renters or those whose leases do not allow them to drill into the flooring. This article examines seven portable scissor lifts for your home garage, so you can decide which one is best for you. All lifts are logically organized by low-rise lift, mid-rise lift and full-rise lift models. Low-rise lifts are the easiest to fit in a home garage because they take up the least amount of space. Granted, they offer less clearance than mid-rise and full-rise lifts, but they offer plenty of work clearance for DIY'ers with a creeper. We've selected a few customer favorites for you to keep in mind the next time you're shopping for a low-profile lift. Simply put, QuickJack is the ultimate portable lifting tool for homeowners. 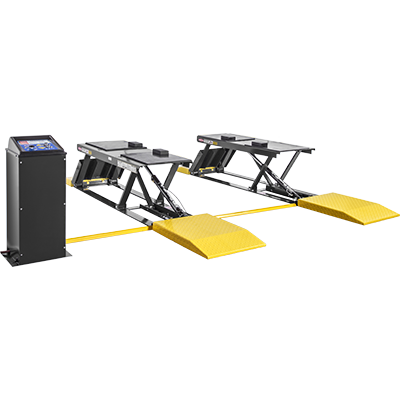 Vehicles lift to the maximum lifting height (20 – 21 inches) in about 30 seconds. There's no other way to get a car in the air this quickly—or as safely—without investing in a more permanent lifting structure. The fact that QuickJack has an open-center design means you won't be compromising functionality, either. 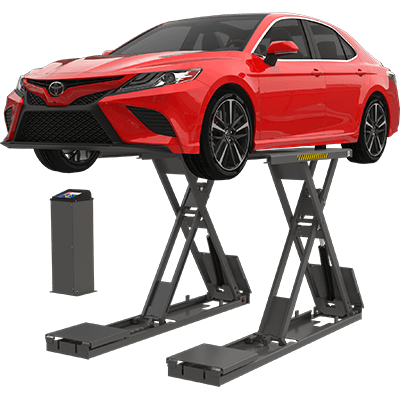 Auto shops, quick-lube stations and other service bays may be interested in a lift that has the portability of QuickJack with just a bit more lifting height. For these businesses, the P-6BF could be the ideal low-rise scissor lift. You have the option to purchase it with or without ramps, which means the "F" model installs flush into a recessed patch of concrete. This makes it virtually invisible when not in use. The P-6B(F) offers a 6,000-lb. lift capacity and achieves a max height of 29 inches. Install it over a pit for fast oil changes and wheel service, or use its built-in wheels to create a workspace wherever you need to get stuff done. The PL-9000LT is a heavy-duty version of the P-6B. It offers a 9,000-lb. lifting capacity, making it the most powerful open-center, low-rise lift on the market. It's easier to move around than a mid-rise lift, but it's still not as portable as the other low-rise scissor lifts discussed in this article. Due to its unique blend of portability and strength, the lift is most commonly used for commercial applications. It still makes a perfect addition to any home garage environment, as it offers the luxury of full undercarriage and wheel access. However, this BendPak scissor lift truly comes to life when placed over a service pit. When used in this manner, techs in the pit can stand while they work, and techs at the surface can perform rapid tire rotations, brake jobs, etc. Whereas low-rise portable scissor lifts are ideal for compact home garages and quick-lube pits, mid-rise lifts offer a little more working height and comfort. The trade-off is that they're less portable and require a bit more overhead space to operate. Since they don't need to be bolted down, they're excellent options for most home garages. These are our customers' top picks for mid-rise lifts. This classic portable scissor lift is a home garage favorite. It's also seen in many detailer studios and body shops. The only downside to this lift, if it's even really a downside, is that you can't access your vehicle's undercarriage. That being said, most of the work done on cars happens at the wheels, suspension, engine and body. In other words, you won't be able to change your oil, drop a transmission or change out an exhaust, but that's fine for the countless happy customers who trust their toys to this lift. The MD-6XP is arguably the most popular mid-rise lift in the world, which tells us that not everyone prioritizes undercarriage access. If that describes you, and most of what you do involves routine maintenance and upkeep, you don't need to worry about "open-center" accessibility. On the other hand, this lift might be limiting if you need a portable scissor lift that's open underneath. If that's you, keep reading! One last cool feature of this scissor lift: The power unit console serves double-duty as the wheels for the lift. It hooks onto the base of the scissor structure and acts as a temporary lever. The lift's built-in wheels will fully engage and let a single person roll the lift anywhere with ease. 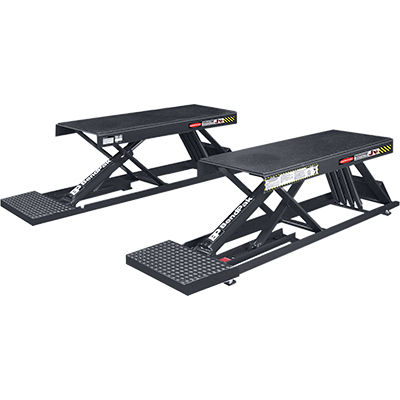 The MDS-6LPF is the flush-mount version of this portable scissor lift model; the MDS-6LP is the same functional lift but with added approach ramps. We think the flush-mount version is ideal for home garages because of how much space it takes up: none. In other words, this lift virtually disappears when installed in recessed concrete. Watch the video below to see what we mean. Many people get a mid-rise scissor lift because the extra lifting height keeps them off their backs. To that end, the MDS-6LPF reaches heights over 40 inches, making basic wheel service a cinch, and the lift's open-center design lets enthusiasts play all they like underneath their vehicle. 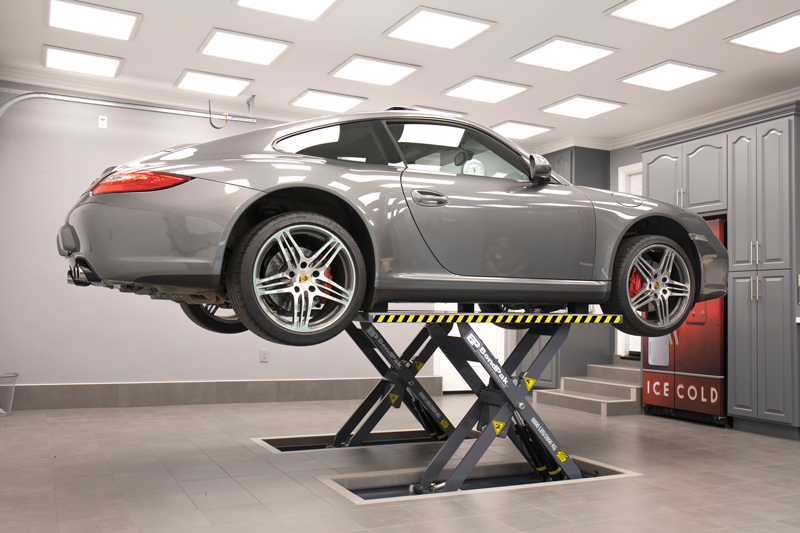 If you have a minimum eight or nine-foot ceiling, this lift will let you raise most sedans, sports cars and low-profile vehicles to the max lifting height. Additionally, most light trucks and SUVs/crossovers are compatible with this mid-rise scissor lift in a home garage. Some long-wheelbase vehicles, like the Tesla S and numerous crew cab trucks, are not compatible with the MDS-6LP series. To solve this problem, we extended the length of its runways and introduced the MDS-6EXT extended-length mid-rise scissor lift. It's similar in most ways to its shorter brother, except the extended model loses a few inches of overall rise. We don't always recommend this scissor lift, because longer runways restrict usage with smaller vehicles. However, it is still more portable than other lifts, offering both above-ground and flush-mount capability, and it does not need to be bolted down for safe use. 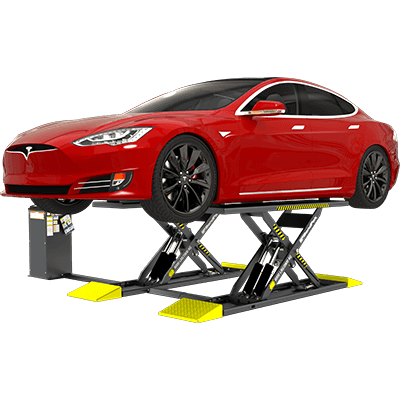 If you repair or detail longer vehicles and/or Tesla S's, this is the mid-rise lift for you. Full-rise scissor lifts may be less common, but they're pretty amazing and often overlooked as an option for your home garage. 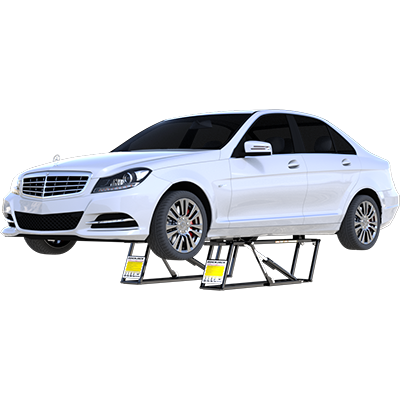 Most of the time, people interested in full-rise car lifts opt for two-post lifts. However, there are some benefits that are unique to scissor lifts. While the model in this section wouldn't be considered portable. The SP-7XL is one of the only scissor lifts to combine design simplicity with the lifting height of a two-post lift. BendPak's simple scissor structures are much less complicated, more reliable and longer-lasting than other scissor lifts on the market. They utilize as few pieces as possible: Only two pieces make up the majority of the structure, so there's less that can go wrong and more that goes right. BendPak redesigned this lift in 2018, bolstering the strength of the steel in certain areas, in order to eliminate the torsion bar. A simple hydraulic line is the only thing you'll find between the frames, but an industrial flow divider provides assurance that both sides lift evenly at all times. As mentioned, both the SP-7XL and SP-7XLF are both completely open-center, eliminating the need to drill a space for the torsion bar and makes flush-mount installation is easier than ever. 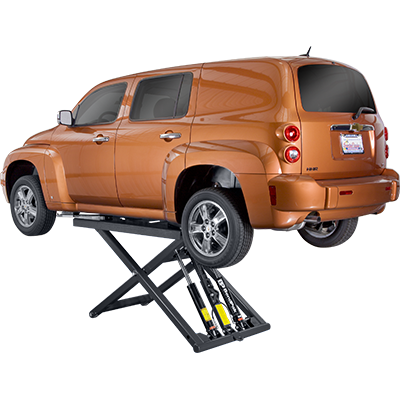 The best thing about portable scissor lifts is that they're more versatile than any other car lift. That's why most car enthusiasts have one of the lifts on this list and not a full-size two-post lift. If you have the room for a taller lift, that's awesome! You should always maximize your space for comfort and safety. However, BendPak scissor lifts are some of the safest in the world, so getting one will not cause you to sacrifice much of anything (such as capability, safety and ease of use). Is there a lift that we should add to this list? Tell us about it on BendPak Facebook.